On beehives, planetary motion, and reasons for not writing reports sooner. Autumn clings tightly to these late November days like the last remaining leaves on the trees. Looking out into my front yard I see that bee hives and abandoned birds nests also populate the branches of trees. I know that the leaves fall and they fertilize the earth and feed the trees for the Spring. 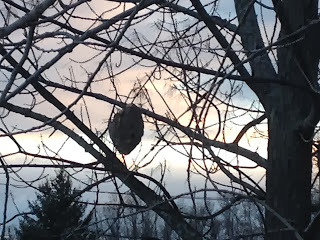 I have been wondering if the bees re-populate their hives, or if the birds recycle their nests. I have to look into that. Why is it that my immediate impulse was to remove these remnants of the Spring and Summer? In my mind I was waiting for it to be cold enough so that the bees would be torpid. I have been developing a plan for the last several weeks to knock the beehive out of the tree, recreating a childhood family tradition of smashing a pinata with a bat on New Years Day. I didn't expect that candy would come out. In fact, I was praying that angry bees would not possibly come out, which is why I was waiting until we were full into Winter. Being a professional beehive tickler, I know the seasons for when you should and should not be messing with beehives. 1. See beehive or similar problem. 2. Poke with a stick. I am kind of glad that the slow disrobing of leaves through Autumn made me notice the hive later rather than sooner. I have had time to think about this, and it is best that I was not seduced to action sooner than was prudent. The world spins at approximately 1000 miles per hour, relatively, but we don't notice it that much because of momentum and gravity and other complex forces. Technically I guess it is around 1000 miles per hour at the equator, which is probably one reason why NASA shoots rockets into space from Florida and not Maine. Anyway, the point is that our relative position on the planet, or in life, causes changes in real and perceived motion through space. I guess I am in a place where I am trying to slow down the data stream and not make hasty decisions. That is so important for us to do - but the counterbalancing stressor is that we operate in systems that create forces that demand action orientation in amounts that might not always be in sync with our relative location. I have been thinking about all this because someone wanted my evaluation report last Thursday, and I am still stewing on the data. The matters are weighty and I don't want to make a hasty decision. The world is spinning and I am trying to slow it down. The Mom does not want to hear me babble on about beehives and planetary motion, so I better get moving. Christopher, First let me say, I love your writing style! Do you write professionally as well? Any way, I digress! In my OT career, I have been put in a position to work outside of "location" many times with treatment schedules, evaluations and notes piled to the sky. I loved what I was doing; but, man, the paperwork load didn't give me enough time to digest the information and produce a quality written product. Hence, in order to do that, I had to stop time and work overtime:) Any way, great blog. Looking forward to more, as I've just "found you." Good luck on that evaluation report! Hi Katherine, and thank you very much for your kind words. I am not a professional writer by any means - but rather living proof that if you put a monkey in front of a keyboard and have it hit the keys - that given enough time something of value might emerge! Your beehive ruminations reminds me of a home health patient I had many years ago. One of her hobbied was collecting these paper nests and her porch was filled with these nests in varying sizes. Quite of few of our "treatment sessions" involved walking around her porch as she told me stories about how she had climbed trees to get these nests. We managed to work in some endurance and energy conservation strategies as she told me her stories.To this day, I can't pass one of these nests without thinking of this wonderful gal. Hi Laura - What a fun story - and great way to connect meaning for this patient into her therapy... thank you for sharing!